Attentive to Western heralds, from Walter Gropius to Richard Long, Walker's essay tells the story of a "form" permeated with mystical knowledge. 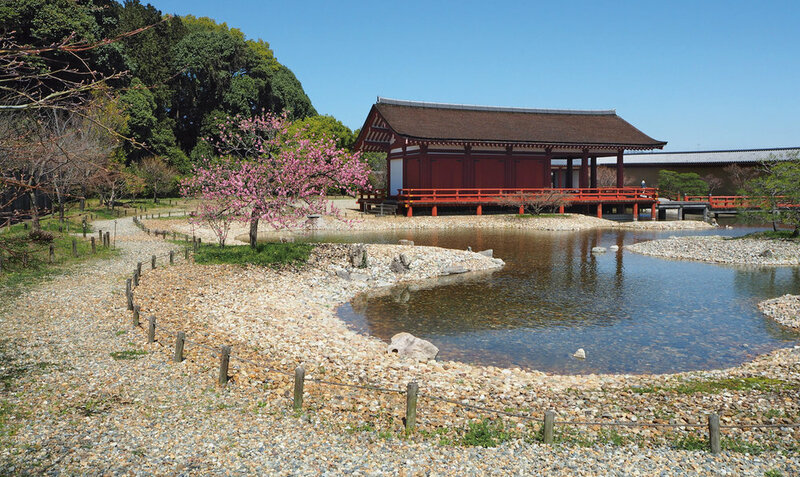 As an art historian, but especially as an award-winning, young garden designer, Sophie Walker proposes an analysis of her historical evolution in the richly illustrated volume dedicated to the Japanese garden. Undoubtedly articulated in the field of traditional aesthetics and culture - following the multiple development paths, types and variations in a review of the aesthetic principles and landscape elements that those principles bring to life in the different contexts - but keeping an eye on their inter-temporality, ranging from the ancient Shinto shrines to the gardens of Buddhist temples, the imperial shrines and, through the waterless gardens, those of tea houses, or those inside the courtyards and patios invisible from the street, to consider the most recent contemporary urban projects, the gardens of embassies and art museums. It is no coincidence that figures of visitors, artists and Westerner scholars whose work was influenced by the Japanese garden are emphasized in the photographic documentation - printed on gray paper, as to lay out an effective meditative patina - together with the cards illustrating one hundred of the main gardens in Japan. From Frank Lloyd Wright to Walter Gropius from Kyoto's Ryoanji to Le Corbusier in 1954, from Yves Klein to David Chipperfield, Sam Francis, David Hockney, to John Cage and his Where R = Ryoanji from 1983, to Richard Long of A Line In Japan, up to Isamu Noguchi. Next, Walker then brings short essays by guest authors, personalities from the contemporary world of art, architecture, design, from the Tadao Ando of the invisible architectures of Naoshima, which grow together with the landscape, to the essay on the gardens of Kyoto by the minimalist Korean painter Lee Ufan, to the Anish Kapoor of the considerations on the void as a potential object. it emerges as a common background how much the art of the gardens of this “East” contemplates, in the mystical dimension founded on the practice of meditation, a strong spiritual component resulting, albeit in various ways, beyond the formal technical aspects, a privileged tool for the transformation of oneself according to a specific cognitive procedure. A process where the designer becomes a choreographer of the physical and spiritual space, including the visitor who, through his experience, "completes the effects of the garden on his senses". In gardens to be traveled physically, involving the body in a performative practice where actively taking part makes us conscious (for example, by the change in floorings) or, mentally, in the face of inaccessible spaces, to be contemplated only through the framed views of square openings (the window of Illusion) and round windows (the window of Enlightenment). Essential spaces, often so abstract - especially in the dry, or karesansui, garden - that invite to free the imagination, evoking the invisible, the hidden, or by analogy the implicit and imagined: according to the way of thinking of mitate, where knowing how to capture something different in the elements of the garden, we understand for example that raked gravel is meant for water. A concept that, through the technique of "borrowed landscape" (shakkei), expands to understand the views beyond the border, beyond the physical space of the garden, in the surrounding landscapes, as well as recalling known scenarios or imaginary views, but also the light of the elusive moon to admire from special terraces (tsukimidai). An expansion of the knowledge that passes through a live network of elements enhancedby the garden. Portals, pavilions, bridges, as well as the ubiquitous presence of the stones, the twisted trees to capture energy, the pervasive use of the mosses to account for the infinitely small change of perspective. Growth of awareness, in solitude as in the relationship with others, where the continuous postponement between interior and exterior, interiority and macrocosm, makes the garden a means of access to wisdom.